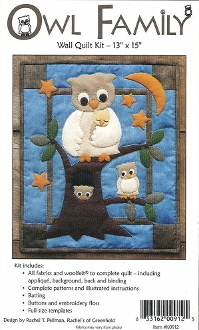 Perfect for your little one's room this wall quilt has a Momma, or Daddy, owl sitting in a tree with 3 little owlets, 1 on a branch, 1 inside the tree, and 1 cuddled under the parent's wing. All this under a star-filled night sky with a crescent moon. Kit includes all fabrics and wool felt needed with backing and binding, patterns full-size templates and illustrated instructions.